My eyebrows and Donald Trump | Kate Mahar writes . . .
Had I known at 14 that experimenting with hair removal would result in the skimpy bits of hair left on my brow today, trust me; I would not have plucked them at all. That’s why I was so reluctant to trim a wayward hair this week. Perched all alone on the downward curve above my right eye, that one renegade hair is all that remains in that section of eyebrow. It’s also still brown, which makes me value it even more. Some of the wilder ones have turned white and it’s hard to decide which is worse: leaving the traitors that make my chosen hair color an obvious lie versus plucking one of the die-hards that hasn’t chosen to leave me permanently. Usually I just trim the long hairs to make what’s left of my eyebrows look neater. Then I fill in the gaps with eyebrow pencil and call it a day. But there was something about that single, long brown hair that inspired me to fashion a kind of brow comb over. For a few days I used a dab of hairspray to coax it into what would be the natural downward line of my brow, if hair actually still existed there. I carefully penciled in faux hairs to fill in the area around it. I even named it Donald, inspired as I was by King of Comb-Overs, Donald Trump. 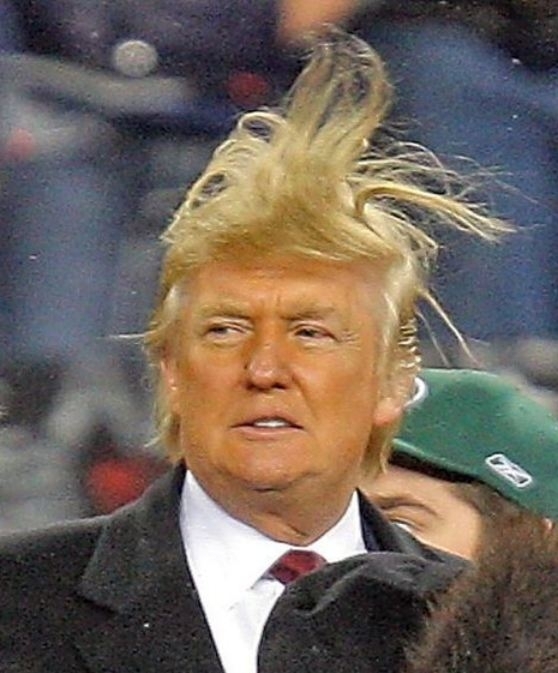 How could anyone take a man seriously who thinks it’s okay to wear his hair like this? Then I thought, who am I kidding? Do I want people making fun of my right eyebrow, the way we make fun of Trump’s hair? Do I want to walk around pretending I don’t know and no one will notice that my right eyebrow just has one, long downward hair? No. He may be delusional and incredibly odd, but I’m not. And I’m not rich enough or eccentric enough to pull it off. I would just like to know who thought it would be amusing in my old age to thin out my eyebrows and reinstate those hairs in random spots on my chin and neck. Oh, and seriously impair my vision so I can no longer see the new hairs without heavy duty corrective lenses, a very strong magnifying mirror and natural sunlight illuminating my neck just so. Between the existence of unwanted feminine chin hairs and Donald Trump as a presidential candidate, I think we can be pretty sure God has a quirky sense of humor. This entry was posted in aging, grooming, humor and tagged chin hairs, comb over, Donald Trump, eyebrows. Bookmark the permalink.